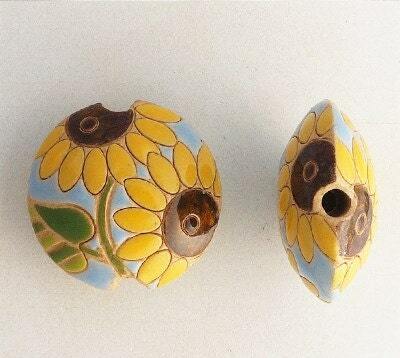 'Sunflowers' ~ are beautifully handcrafted ceramic lentil beads made in Bulgaria. Cute bead! Fast shipping! Thank you! All the beads are just fabulous and will be great in my designs. Beautiful bead. Received thoughtfully packaged and in a timely manner. Thank you!!! Just Fabulous!! I am eager to create with these artistic and beautiful beads.... even more amazing in person. Mahalo, I will return... and Aloha from Maui!